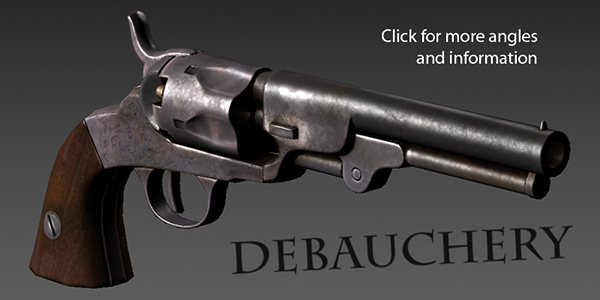 Finished model of the Bacon Pocket Revolver for Debauchery. Contrary to popular belief, this five shot, .31 caliber pocket percussion revolver is NOT, in fact, made out of bacon. It is, however, non-reloadable and highly disposable, able to be found all around the maps of Debauchery and even wielded akimbo. Non-reloadable gun? Don't think I've heard that one before. hahaha, i was wondering. why add a weapon that can't be reloaded. "non-reloadable and highly disposable, able to be found all around the maps of Debauchery and even wielded akimbo." i asume you did choose for this option because now you don't need to make the animation of re-loading this weapon. nice thought, and it works too. it's the same, re-loading or finding the weapon at different places in the map. weapon does look AMAZING !!!! Even that gun is reloading able, it will take like 6-15 second, which make you a easy target. Very nice, but does it need a news post? It's called hyping your mod/game. Basically, not feasible in terms of gameplay. In that case, I hope there will be a new york reload style animation where the revolver is dramatically thrown aside and a new one is drawn (if available). I don't understand how this works! You look into the round thing and when you pull the **** you get candy, yes? Perverts! Akimbo...? To be honest, I don't like that idea. However, the model looks great. Non-reloadable...that too seems like a problem, just for gameplay sake it seems easier just to reload it and keep going. That type of gun seems like the one you use as a last resort, kind of like using a pistol in a shotgun firefight. Beautiful texture. Looking forward to more! Wait! Not out of Bacon? This makes no sense!!! Why should you call it "Bacon Pocket Revolver" if it is not out of Bacon? nice, cant wait for this!